Suicide is a leading cause of death in Australian men – they take their own lives at three times the rate of women. Our awareness around male suicide has increased in Australia over recent years with a growing number of organisations and campaigns devoted to its prevention. But by focusing so much attention on the gender gap in suicide, are other social factors that predict a risk of suicide being overshadowed? One of those is disability. Our team sought to fill the gap in research on disability and suicide. And based on our findings, men who reported a disability were more likely to think about suicide than other men. In the context of male suicide prevention and mental health promotion in Australia, this tells us that more consideration should be given to the needs and experiences of men with disability. Our study, published in the Journal of Public Health, analysed a national study on men’s health. This study collected data on 8,000 Australian men aged 18 to 55 years who participated in the first two waves of the study; we then incorporated a broad measure of disability. We defined the term disability as a difficulty functioning in domains related to social participation – by this we mean having trouble with things like self-care, walking or using stairs, as well as challenges communicating and being understood. These are all restrictions that can have an adverse impact on a person’s ability to work, form relationships and get out of the house – but are not necessarily defined as ‘ill health’. Consistent with previous research, we found that men with a disability were more likely to be unemployed than non-disabled men, and many had poorer mental health. Nearly ten per cent of men with disability had experienced suicidal thoughts in the past year, compared to four per cent of those without disability. After accounting for underlying mental health scores and other factors, men with disability had about 1.5 times greater odds of suicide ideation – that is, thinking about suicide – in the past 12 months than non-disabled men. But this risk was non-significant after considering other important explanations for thoughts of suicide. In fact, having a disability was associated with about the same odds of suicidal thoughts as being unemployed, after taking underlying mental health and other factors into account. Let’s not beat around the bush – researching disability and suicide is difficult and occasionally fraught. It means coming up against some factions of the medical establishment who see disability as something that inherently reduces quality of life and should be cured or prevented altogether. Often, these misunderstandings of disability are reductive and stigmatising, and form part of a broader societal devaluing of the lives of people with disability. When these beliefs intersect with the issue of suicide – troubling perspectives emerge. Our research wasn’t interested in reinforcing any of these harmful attitudes. We worked on the basis that there isn’t anything inherent about living with a disability that should ever lead a person to want to end their life. Factors such as unemployment and poor mental health – which are a well-recognised risk factor for suicide – may be greater influences on whether a person thinks of suicide than whether they have a reported disability or not. We found that both unemployment and poor mental health were more common among men with a disability than those who did not report a disability. There are also important lessons to be learnt here when it comes to future research into this area. There must be a thorough examination of the structural and social factors, including discrimination and stigma, that impact the wellbeing of people with disability. Intervening and altering these factors may be key to improving mental health and reducing thoughts of suicide in this population. 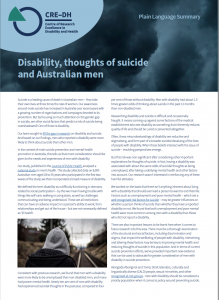 And in terms of current suicide prevention efforts, we’ve provided important new evidence that can be used to advocate for greater consideration of men with disability in suicide prevention. Alongside Aboriginal and Torres Strait Islanders, culturally and linguistically diverse (CALD) people, sexual minorities, and other recognised at-risk groups – men with disability should be considered a priority population when it comes to policy around preventing suicide. We used data from the first two waves of Ten to Men, a national survey of male health. Participants were recruited at the household level and completed paper questionnaires. The total sample size for this analysis was 7,858 men aged 18 to 55 years. Milner A, Bollier A, Emerson E & Kavanagh A. The relationship between disability and suicide: prospective evidence from the Ten to Men cohort, Journal of Public Health, 5 November 2018 (Epub ahead of print).